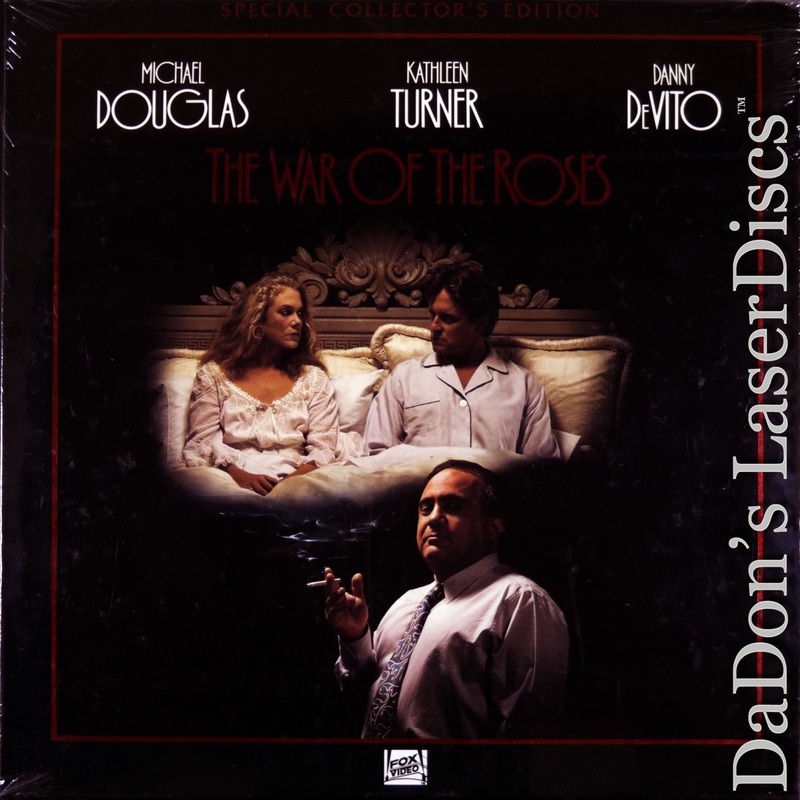 The War of the Roses 1989 - 116 min. 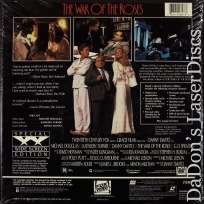 - Color Genre: Comedy Rated R Country: USA LaserDisc Movie Storyline: Danny DeVito directs this black comedy about a long-married couple in the throes of divorce at the height of the materialistic 1980s, and his second feature far surpasses his first effort, THROW MOMMA FROM THE TRAIN, in style, substance, and comedic impact. 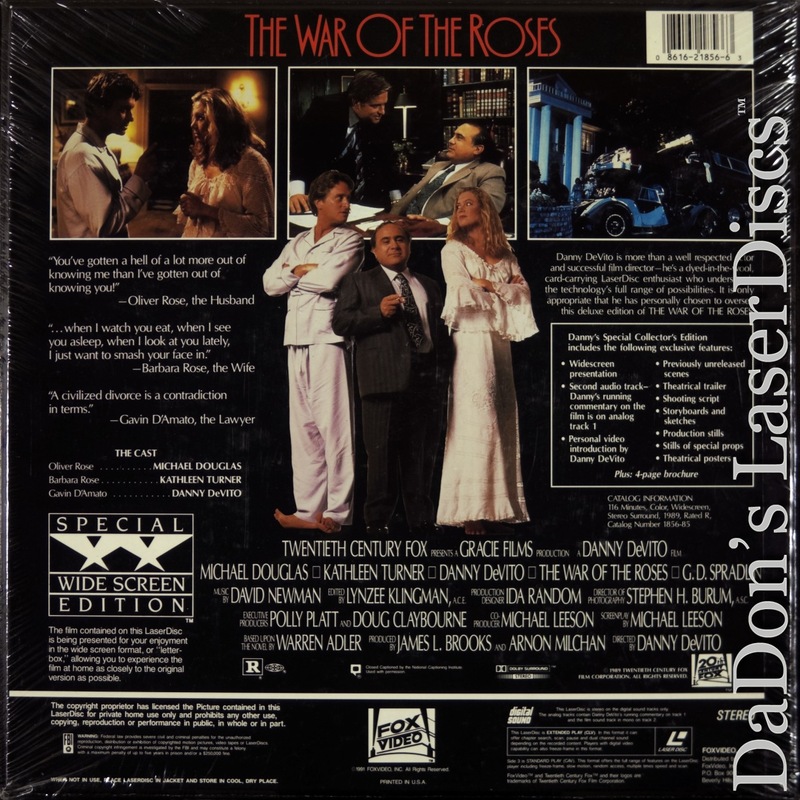 Barbara and Oliver Rose were the perfect couple--he was a prominent Washington lawyer, she had a wildly successful catering business, they had a great house, great art, great cars and great kids. But when Barbara begins to wonder about life without Oliver, she likes what she sees and sues for divorce; unfortunately, neither of them likes the prospect of life without their opulent home, and war is waged to determine who will keep it. The pair become increasingly outlandish in their battle tactics, moving from cunning to cruel to outright surreal, and DeVito's camera echoes this mood with its unorthodox angles and movement. DeVito himself narrates the action as Oliver Rose's lawyer, and Kathleen Turner and Michael Douglas prove once again their chemistry as a passionately antagonistic couple (ROMANCING THE STONE, JEWEL OF THE NILE).